We are also those who live in the most extreme violence: the femicides; assaults, disappearances, death at the hands of a husband, a boyfriend, a cop, a narco. We are those for whom going to school, to the market, taking the bus on the corner, means to risk never coming back. But we are also those who care for territories, forests, bodies, culture: life. Here, in the State of Mexico, all the factors that define the periphery come together. Our gender, our empty pockets, our scorched skin color are denied, spit upon and vilified. We are told that we are from “Mordor”, which translates as “black country” in a language from the Lord of the Rings fantasy literature saga. And it is so that an hour and half from the heart of Mexico there is no law worth anything. Security is a state of siege in the streets and politics is a narco-murderer-corrupt-femicidal government. Because for us the word “citizenship” is conceived of as a depository of gifts and provisions and progress is nothing more than the transformation of Mother Earth into concrete slabs and precarious work. All this is the way of life created by the Institutional Revolutionary Party (PRI); the father of the way of doing politics – official and clandestine – in the State of Mexico. The way to obtain votes is PRIista, even when another political party governs; the discourses of tasteless modernity are PRIistas; the grasshoppers that hop from party to party, PRIista in origin; the police and shock groups, PRIistas; the drug traffickers, all commanded by PRIistas. We want to say, then, that in the State of Mexico, PRIism founded its edifice of corruption, its bribery and contempt for the populations that actually comprise it. And if someone rejects their gifts, if someone refuses to be corrupted; there is jail, there is a bullet, there is a club, there is tear gas. This is how we have lived for more than 80 years. Across the capital’s borders towers the eye of those who have governed, trafficking in our needs, for almost a century. The PRI of the State of Mexico is a clan; families who, like royalty, gluttonously consume the public goods. The Fabela, the Montiel, the Del Mazo, the Peña, invented the sayings: “a politician who is poor is a poor politician”, “he who doesn’t deceive doesn’t achieve”, “if there aren’t public works there aren’t surpluses”; and with them they rule in their principality. Now, the Mirreynato called Grupo Atlacomulco* governs with its perfumed hand throughout all corners of the country we call Mexico. We don’t claim that Mexiquenses have the only bad governments in the country, but we live in the center of all their origins. We’ve seen during these years of Enrique Peña Nieto’s presidency that the entire country is suffering what we have lived through for decades in the State of Mexico. That’s why they have to care for the heart of their project. The PRI-government needs to obtain another six years in the State of Mexico through the “first cousin of the nation”, Alfredo del Mazo. And the next elections in the State of Mexico are national, not local. Hence the presence of governors and ministers from the supreme bad government, who show their support for the official candidate with water tanks, televisions, construction material, pre-paid credit cards, food distribution. His campaign slogan reveals his intentions against those who oppose him: “strong and with everything”. And the phrase “to change everything can also mean to lose everything” is his blackmail. Because everything is at play in this election. But for those of us who live here, this play is daily. Paradoxically, our peripheral geographical and cultural character has placed upon us an obligation. In the State of Mexico, everything that gives shape to the country’s capital emerges and is protected here. Those of us who live on the border of the city and the countryside have defended the right to breathe, to work, to electricity, health, education, food; and especially, the right to water and to life. Despite their proximity to the cities of Mexico and Toluca, of Querétaro and Pachuca, the forests, lands, lakes, rivers and volcanos still remain. We take care of them because they are the material, environmental, social, cultural and symbolic foundations of our peoples and communities, because our heart is collective, we live in a place where the coyote fasts, on the hill of air or in the valley where the nine waters flow. Nahuas-Otomís-Mazahuas-Tlahui Cas-Matlazincas, we are the indigenous peoples who have inhabited this territory since before the colonial invasion. Today we Ñuu Savis, Mazatecos, Zapotecos, Totonacos, Ayuks, Chinantecos, Tlapanecos, Mayas, Tseltales, Amuzgos, Tepehuanos, Tsotsiles, Cuicatecos, Huaves, Choles, Wirrarikas, Triquis, Zoques, Chatinos, Tojolabales, Pames, Tepehuanos, Popolucas, live here also. 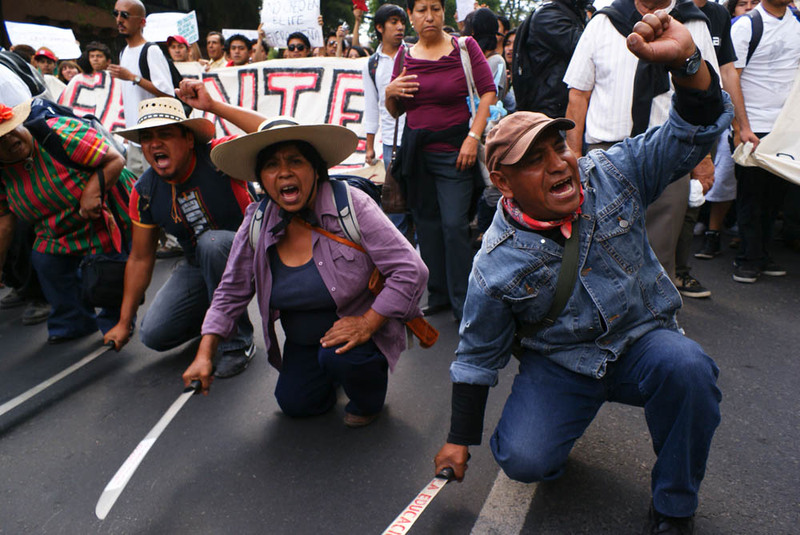 From our peoples today springs the greatest alternative proposal for the State of Mexico: the struggle for and the defense of life with dignity and autonomy. Decades ago, some representatives of these peoples signed a pact to protect what we are: it was called the Matlazinca Pact. After them, towns such as Atenco reminded all of Mexico of the value of the land and of the old Texcoco Lake when facing a massive airport. Various networks, indigenous fronts, many times with women at the head, led the defense of water and forests. 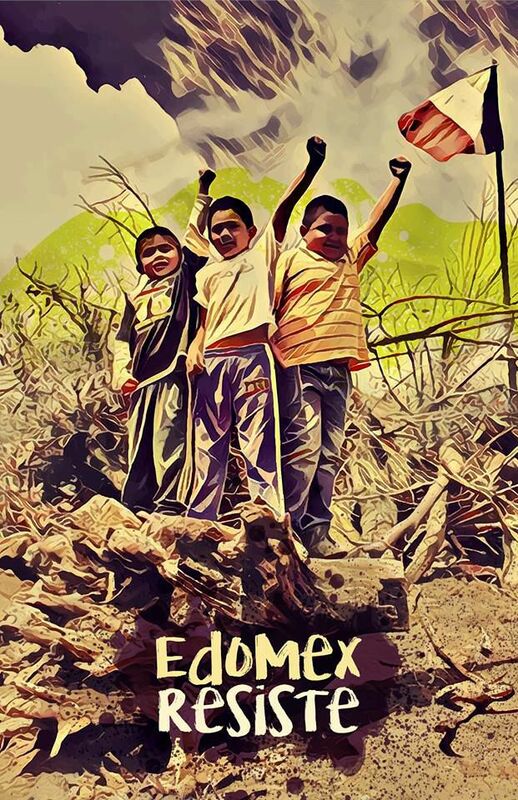 Today, the Otomí-Ñatho people of Xochicuautla have become, together with their neighboring towns, the paradigm for the defense of the forests and their archaeological, symbolic and cultural heritage when facing a highway granted to Grupo Higa, owned by Peña Nieto’s favorite contractor. Our peoples teach the value of the land in the face of commerce and show the true clash of civilizations: modern colonization against care for the planet, sometimes in exchange for prison, as happened with our one compañera and five compañero prisoners from the Nahua community of San Pedro Tlanixco. Added to the peoples’ struggle is the search for an education for everyone, for a dignified life in the city and the battle against the rampant femicides and gender violence. The fact that the Zeferino Ladrillero Human Rights Center, which assists the communities, peoples and collectives of the State of Mexico, has won the Sergio Méndez Arceo Prize – the main independent recognition of human rights work in the country – is an example of the spirit of dignity that runs from the east, passing through pyramids territory, and charges to the doors of Toluca. One year ago the State of Mexico’s congress enacted a terrifying law. The media called it the Atenco Law; we re-baptized it as the Eruviel Law, because it came precisely from this governor and not from the dignified peoples of Atenco. This law would grant to the police discretion over the rights to protest. We see in this law, against which we have fought repeatedly, the means to extend the Grupo Atlacomulco’s style of governance through the country. Yet again we have this threat before us and we declare we will tear down this and all attempts to destroy our freedom. We are just votes to the PRI and all the political parties that serve as extensions of it. We refuse to be a “bastion” of the PRI. We refuse as well to be accumulated political capital, and more profoundly, we refuse the paralyzing and slow death that the PRI-State offers us as a future. Especially in order to build a future for the smaller generations who are already beginning to learn new ways of existing in our territory. Therefore, in the face of the PRIista steamroller and its intimidating plan, as collectives, organizations, peoples and individuals from the State of Mexico, we raise our voices to begin a strong process of information and resistance. Today, 98 years after the death of Emiliano Zapata, who left a strong imprint on our state, we repeat here the request that the Náhuatl general used to end his statements: We plead with the one whose hand approaches this manifesto that they help it reach the entire State of Mexico. Asociación de Productores de Maíz Coronel José Isabel Linares AC de Santiago Tlacotepec · Brigada Comunitaria en Resistencia Contra el Urbanismo Salvaje – San Pablo Tecalco · Campesinos del Sur del Estado de México, Guerrero y Michoacán por la Defensa del Río Temascaltepec · Centro Cultural Tierra y Libertad · Centro Educativo, Cultural y de Organización Social (Cecos) · Colectiva, Genera red de mujeres · Colectivo Audiovisual Do Xante · Colectivo Contantik · Colectivo Danza en Resistencia · Colectivo Livertaria · Colectivo Nezahualcóyotl Combativo · Colectivo Raíces · Colectivo Zapatista Neza · Comité para la Defensa de los Recursos Naturales del Xinantécatl y Río Temascaltepec · Comisariado Ejidal de San Diego del Cerrito · Comunidad Shanka, Toluca · Consejo Indígena del Trueque · Consejo Supremo Indígena de San Francisco Xochicuautla y comunidad indígena de San Francisco Xochicuautla · Colectivo Surterráneo Distro · El milagro, danza en Resistencia. Colectiva escénica · Grupo Latinoamericano de Estudios Formación y Acción Feminista (GLEFAS) · La Voladora Radio · Movimiento Juvenil Huitzizilapan · Movimiento Mazahua Para la Defensa de los Recursos Naturales y Derechos Humanos · Núcleo de Resistencia Juvenil · Proyecto de Arqueología Popular (PAP)- · Taller Integral para el Desarrollo Comunitario (TAIDECO AC) · Tlalmino – organización de rescate cultural · Red Denuncia Feminicidios Estado de México · Red de Antropologías Populares del Sur (RAPS) · Semillero Itinerante del Estado de México · Seminario Mundos Rurales Tierra, Territorio y Territorialidades · Tik Tik-Pan. Cooperativa integral · Rodadas en Defensa de la Madre Tierra · Fuego de la Digna Resistencia: Acuexcomac unido · Administración Autónoma de Agua Potable de Coyotepec · Alianza Única del Valle · Apaxco comunidades por la vida · Cahuacán unido · Centro de Derechos Humanos Zeferino Ladrillero · Comisariado de Bienes Comunales de San Lorenzo Huitzizilapan · Comisariado Ejidal de Coyotepec · Comisión Indígena en Defensa del Agua, la Tierra y el Aire de Amecameca · Comité de Agua Potable de Huitzizilapan · Consejo de Vigilancia del Sistema de Agua Potable de Santa María Ozumbilla · Coordinación de Pueblos en Defensa de la Energía Eléctrica · Defensores de los bosques de Temoaya, Delegación indígena de Zacamulpan Huixquilucan · Delegación indígena por usos y costumbres de la cima y cañada de Huixquilucan · Familiares de la presa y presos políticos de Tlanixco · Frente de Pueblos de Temascalapa · Frente de Pueblos en Defensa de la Tierra de Atenco y Texcoco · Frente de Pueblos Indígenas en Defensa de la Madre Tierra Santa Cruz Atoyuxco · Frente popular 9 de junio en Defensa de los Recursos Naturales de Coyotepec · Magisterio Mexiquense Contra la Reforma Educativa · Pueblo indígena Otomí de San Francisco Magu · Resistencia Independencia en Naucalpan de Juárez · Reyes Acozac, Sistema de agua potable de Tecámac A.C. · Vecinos unidos de la zona poniente. Individualidades: Abraham Bosque – Músico · Al-Dabi Olvera – Contador de historias · Alma Lilia Ríos Colín – Reportera · Antonia Zafra Arias – Pedagoga · Daro – Poeta · Efraín León Hernández – Geógrafo · Diana Alejandra Betanzos Avilés – Bailarina · Emilio Gerardo Arriaga Álvarez – Sociólogo · Federico Gómez – Ciudadano mexiquense de Melchor Ocampo · Fercam – Artista urbano · Iván Cervantes – Activista medioambiental y científico · Gabino Giovanni Velázquez Velázquez – Geógrafo y docente · Gryzza Gallardo – Músico · Israel Isk – Artista gráfico · Jimena Marin – Activista y estudiante FES Aragón · Josefina Itandehitl Orta Rosales – Artista · Lilia Zizumbo Villareal – Socióloga · Luz Emilia Aguilar Zinzer – Periodista y ambientalista · Lorena Torres Bernardino – Politóloga · Maria Eugenia Torres Echeverría – Investigadora · Max Omar – Musico y Productor Musical · Neptalí Monterroso Salvatierra – Agrónomo · Oliver Hernández Lara – Sociólogo · Patricia Estalanta – Bióloga · Pablo Gaytán – Sociólogo · René Arenas Rosales – Economista · Rubén D. Arvizu – actor, director, escritor, productor y ecologista · Soberanes – Poeta · Thu’bini Mäst’öhö, profesor de lenguas Hñähñu, Tu’un Savi y Nauatl y artista. *Translator’s note: Mirreynato refers to the rule of mirreyes, slang for young, stylish, ruling class male elites. Grupo Atlacomulco is an alleged, likely real, political organization of powerful individuals inside of the PRI whose purpose is ensure state power remains within their group. The families listed above are all assumed to be members. Current Mexican president Enrique Peña Nieto is a Grupo Atlacomulco member and mirrey par excellence. This entry was posted in Mexico, Translations and tagged atenco, edomex, enrique pena nieto, mexico, resistance, translation, xochicuautla. Bookmark the permalink.